This 3.8 x 36mm cross cut multi functional shredding macine destroys paper, cds, dvds, floppy disks and credit cards. It has an integrated Auto Reverse Function for easy removal of overloaded paper. EcoLogic technology for real energy efficiency. 30 year cutter warranty. 2 year machine warranty. 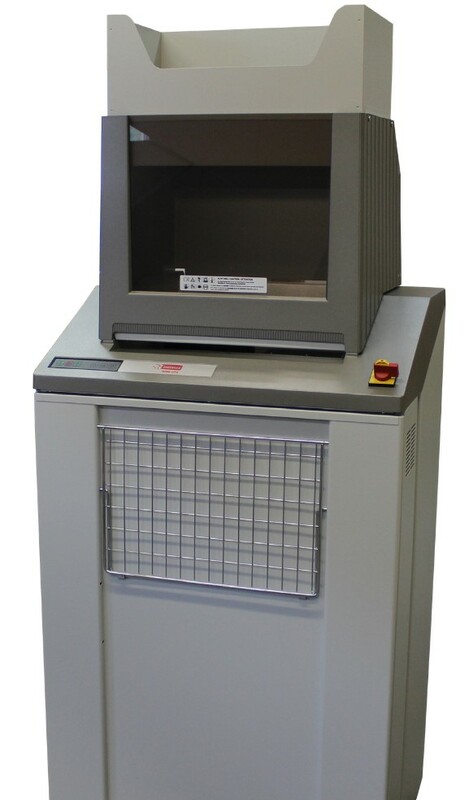 This High Security 1.9 x 15 cross cut shredding machine destroys paper and credit cards. Low noise level • Automatic start and stop. • Dustproof enclosed cabinet • Mounted on casters for flexible use • The casing is made of shock resistant plastic, the cabinet wood • Low noise level • It has an integrated Auto Reverse Function for easy removal of jammed paper. CPNI approved • DIPCOG approved. Warranty 2 years on machine. 2 years on cutters. The multi functional strip cut shredding machine with 3.8 or 5.8 cutting widths. This shredder destroys paper, cds, dvds, floppy discs, and credit cards. 38 Sheet capacity (5.8 ver) 33 sheet capacity (3.8 ver). 120L bin. 310mm wide throat. Waste separation for easy recycling. 2 year machine warranty. 30 year cutter warranty. Up to 650 Sheet Capacity. 7.5 Kw Motor. In feed conveyor belt. 500mm in feed width. Made in Germany.